Catering of food for Wakes and Funeral Receptions are the most important and serious functions that we undertake. In over 25 years of experience of catering for Wakes and Funeral receptions in the Edinburgh area we have learned how to make the day run smoothly, our expertise is second to none. We provide food delivered to venues and function rooms, either your own home, community halls, bowling clubs, church halls, golf clubs or anywhere that the family wishes the food to be served. 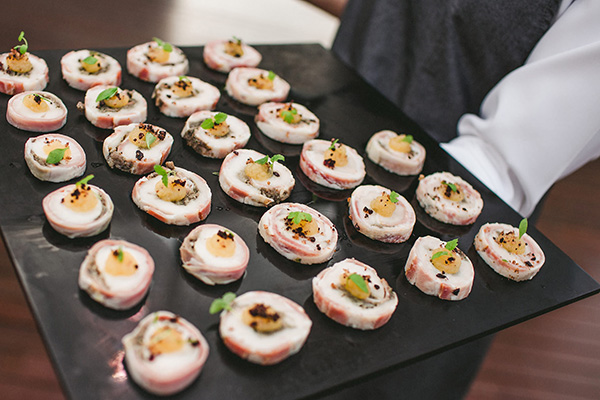 We supply the full range of food presented in the manner appropriate to the situation, prepared in accordance with any dietary needs for large or small gatherings. It is already a difficult time so why not let an experienced professional take the strain out of providing the food. Dealing with all that surrounds funerals is hard enough without having to take on the catering too, we can even provide serving staff at the venue of your choice. – Thanks you James for catering so well for husband’s wake. The service on and before the day was excellent. Your staff looked after my family so well. The food was delicious and a credit to yourself. A big thanks you from all the family. – Many thanks Jim for a job well done. We do appreciate your sensitivity and great all round service. The food was also delicious. – I’d like to re-iterate our thanks, the service in terms of food, staff, support was wonderful. Your understanding of the family’s emotional circumstances was very much appreciated and helped us through a very difficult day. Due to this deep understanding of our clients needs at this difficult time, we are well placed to offer our advice and services as we have been providing catering services for all occasions including wakes for many years in a wide variety of venues including; hotels, church and community halls, bowling clubs, golf clubs and your own home. Whatever your needs, call us to discuss the funeral arrangements. We offer a variety of menus to suit every budget and occasion, along with serving staff and bar staff as appropriate to take the strain off the family and organisers. We understand what a difficult time that it can be so take a look at our Testimonials for some additional reassurance. Visit our Wakes and Funerals page to see menus, although anything can be prepared for your needs such as dietary needs or serving wine if requested.